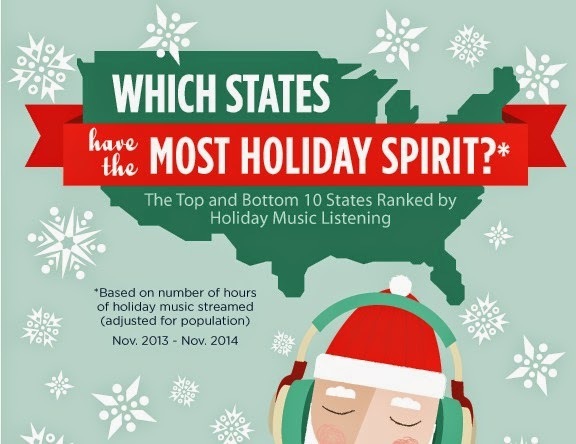 Which States Have the Most Holiday Spirit? Naughty or nice? Our elves have discovered that one way Santa determines which list you made is by how much holiday spirit you have- and to judge that, we’ve turned to holiday tunes. We ranked all the states according to how much holiday music they streamed over a year, and used the results to make a couple of lists of our own. Here’s how our version of A Christmas Carol looks. Over on the nice list, Washington, DC comes out on top, with the National Christmas Tree and White House holiday concert attracting the attention of the nation. Next is Pennsylvania, home of Christmas Cit, USA, and Tennessee, where Elvis had many a Blue Christmas. New Jerseyians, unfortunately, can expect lumps of coal for Christmas, since not even Bruce Springsteen’s “Santa Claus is Comin’ to Town” could get them into the holiday spirit. Wyoming, the top producer of coal in the U.S., and Hawaii also make appearances on the least Christmas spirit side, as does (surprisingly) Alaska. Even if you reside in New Jersey or Wyoming, chances are that one of the most popular holiday songs can make you feel a little bit festive. If that’s the case, tune in to the Christmas classics, like “It’s Beginning to Look a Lot Like Christmas” by Bing Crosby or “A Holly Jolly Christmas by Burl Ives.” Avoid Grinchiness by staying away from tunes that people seem to dislike, such as “Christmas Don’t Be Late” by Alvin and the Chipmunks and “This Christmas” by Chris Brown. Don’t forget that Santa sees you when you’re sleeping, and he knows when you’re awake- so take that into consideration next time you’re choosing your music playlist. Who knows? It might save you from getting a few lumps of coal in your stocking on Christmas morning!